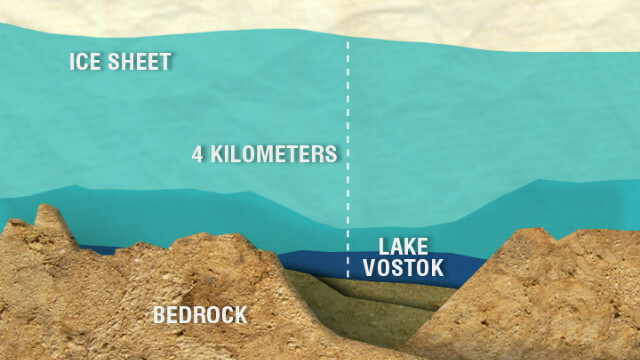 State-run RIA Novosti says scientists have finally reached the lake's surface after more than two decades of drilling. It was no easy task. Temperatures at Vostok Station can drop below minus-80 degrees Celsius. Scientists believe the pristine waters could hold life... possibly primitive bacteria or something that evolved in isolation. But there are fears that research could contaminate Lake Vostok with drilling fluids or the kerosene needed to keep the borehole from freezing over. Lessons learned from Lake Vostok would stretch far beyond our planet. Its conditions are thought to be similar to Jupiter's moon Europa. So the South Pole could very well heat up the hunt for ET. I suppose it's asking too much to hope they've opened up a 20-million-year-old biological Pandora's Box, accidentally unleashing some microbes with which homosapiens has never had to cope. About time for another evolutionary bottleneck?